The Hallie Ford Center and Joyce Collin Furman Hall at Oregon State University have been selected to receive the 2013 DeMuro Award for Excellence in Preservation, Reuse and Community Revitalization by Restore Oregon. The Hallie Ford Center is being recognized as an outstanding example of compatible infill development within a historic district. Furman Hall is being recognized for the extraordinary complexity, creativity, design and craftsmanship of its historic rehabilitation. They are among seven Oregon buildings to be honored with the award this year. The awards were presented at a banquet Wednesday in Portland, which included a guest presentation by Portland Mayor Charlie Hales. The DeMuro Award honors extraordinary historic rehabilitation projects and compatible infill development across Oregon – residential and commercial, urban and rural, private and public. The award is named in honor of Art DeMuro whose redevelopment of historic properties such as the White Stag Block set the standard for quality, creativity, persistence, and business acumen. According to Restore Oregon, the Hallie Ford Center is an outstanding example of compatible infill development that harmonizes beautifully with its neighbors. “It makes a distinct statement that’s of its time, yet is complementary in scale, massing, proportion, and materials, enhancing the story of the historic district,” Restore Oregon staff noted. The Hallie Ford building houses the Hallie E. Ford Center for Children and Families. Made possible by a gift from late Oregon philanthropist Hallie Ford, the center opened Sept. 8, 2011, and is home to interdisciplinary, collaborative research from the College of Public Health and Human Sciences. 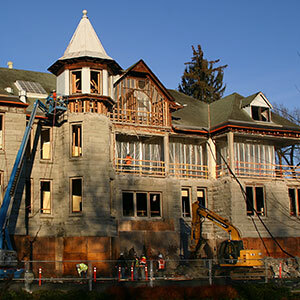 Furman Hall, which was originally built in 1902 and recently restored, was honored by Restore Oregon for being rescued from a deteriorating and dangerous state. Seismically unsound and wrapped in netting to protect pedestrians from crumbling sandstone, Furman Hall was structurally rebuilt, its interior redesigned, and sandstone façade replaced in kind. Education Hall, originally built in 1902, re-opened as Joyce Collin Furman Hall in January 2012, following a complete renovation. An iconic structure at the campus’ east entrance, the renovated building blends historic charm with high-tech touches. The exterior seismic upgrades were funded by the state, and the interior renovations were made possible by private donors, including a $2 million gift from William A. Furman through the Joyce N. Furman Memorial Trust.